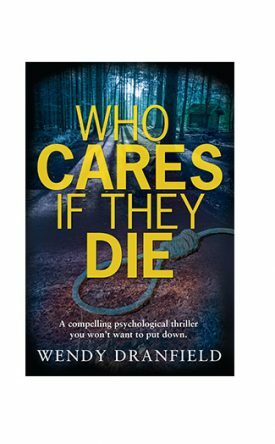 Wendy is a British crime thriller writer who lives in the UK with her husband and 3 rescue cats. 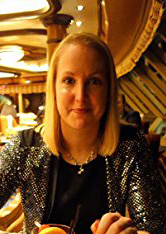 After completing a degree in Creative Writing & Philosophy, Wendy is now an author of a dark Young Adult novel (which was long-listed for the Mslexia Novel Competition) and of several short stories published in anthologies. Who Cares If They Die is her debut novel with Ruby Fiction. You are constantly hurled back and forth between emotions and somebody thinks it’s a good idea killing women who are socially marginalised. They do not really seem to serve any pupose anyway, do they? Sometimes the author chooses to keep the culprit’s identity a secret until the end. Sometimes, the name is revealed a lot sooner and sometimes we know from the start who is repsonsible for all the nastiness. If you want to know which structure is picked here, you will have to find out for yourself. I promise you, you will not regret reading this story. This had me hooked from the first chapter and I couldn’t put it down. The story starts with a suspected suicide found in the woods, Dean Matheson thinks there may be more to it than first meets the eye. When a second death occurs and a senior member of his team is taken ill the case is passed to Dean to solve. But it’s not just work he has to deal with, his personal life is falling apart. The identity of the killer is suggested at fairly early with clever hints that something’s not right, but I was with Dean every step of the way willing him to put two and two together and to catch the killer before they strike again. This is a multi layered story written in the present tense and I loved every minute of reading it. I’m not usually a fan of this genre but Wendy’s converted me and I look forward to reading more from this author. This seriously involved crime story is really gripping. A small town in USA has a mysterious suicide. Things then really start to happen! The local police department is shown in full glory, their dogged determination to find out what is happening in their town but also their human frailty. The oh so very human star of the book, Dean, strikes up a friendship with newcomer Beth and we read about the development of this romance. I don’t want to write more as it would be too easy to open the sack and let out one of the many cats! Suffice it to say this is a brilliant crime story with romantic overtones which I am sure everyone will thoroughly enjoy. Read in two hooked sittings. It would have been one, but I fell asleep reading having pulled an all-nighter the evening before. Delivered to my kindle by the team at choc-lit and ruby fiction in return for an honest review. Synopsis: The first scene starts with a hanging woman in Maple Valley woods. A Jane Doe without shoes, it looks like a suicide, but to Officer Dean Matheson, something doesn’t add up. Soon after, there are two other apparent suicides; a drug addict and an incarcerated criminal, both female. Outwardly there is no one to challenge the circumstances of the deaths but forensics uncover evidence of a possible murder, so Dean Matheson is making it his business to care, even if it means he may become a target. Review: A pacy read that had me hooked from the start. The main character and dog lover, Dean Matheson, is a flawed human being and therefore easy to empathise with. His marriage is hanging by a thread and his job is hindered by an overbearing and slothful boss. Something many of us can relate to. Ordinary fella he may be, but it turns out that there are secrets that will jeopardise his marriage and ultimately his life. I really enjoyed reading this book. I like a thriller, and even better one which gives away the ‘baddy’ towards the beginning. By doing so, the author runs the risk of the big reveal not being the pivotal outcome, but here, you are led through the back story of the characters and kept avidly reading to the end and climatic finale. Very well constructed and thoughtfully planned. There are painful secrets, haunting memories and loves lost. Family relationships are explored, so too is small town mentality. Last but by no means least, there is a Rottweiler called Rocky. Rocky is both lovable and flatulent, the pancake shenanigans are an ingenious addition! Not wanting to give away any spoilers but, I am not big subscriber for a happy ending, I like more plausible conclusions, and this tale brings that balance into play, beautifully. At the end of the book, we are told this is the first of a series of stories involving Dean Matheson and asked, by the author, what we may like to see come along in future episodes of his life. Well I for one, would like to see him find a bit of solace, but not too easily and have many adventures with Rocky at his side but maybe, with less pancakes! Rating: 5 STARS – A Great Read!